Upgrade to vCNS 5.5.3.1 from: vCNS 5.1.1, 5.1.2, 5.1.3, 5.1.4.x, 5.5.0, 5.5.1, 5.5.2, 5.5.3. You must first upgrade the vShield Manager, then update the other components. 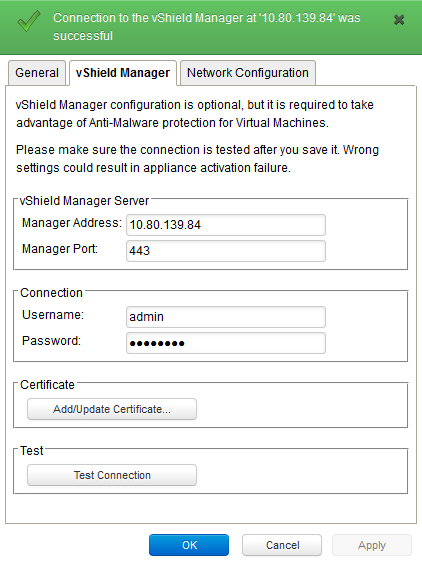 First, take a snapshot of vShield Manager virtual appliance! 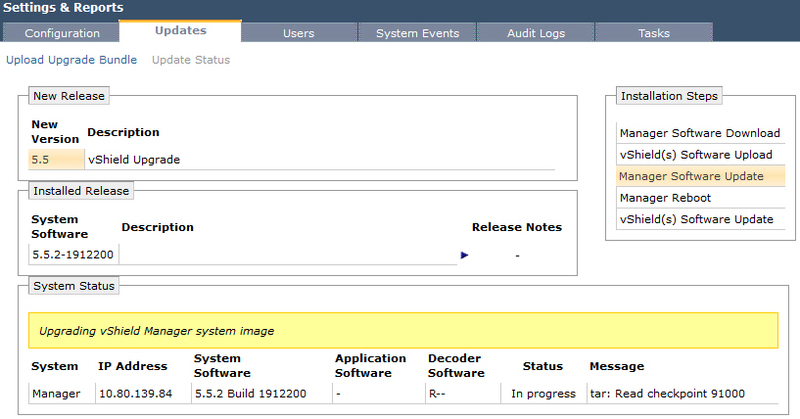 Login to vShield Manager, navigate to inventory panel, View: > Host & Clusters, click Settings & Reports. Click Browse and select the VMware-vShield-Manager-upgrade_bundle-buildNumber.tar.gz file. After the file is uploaded, click Update Status. Click Install to begin the upgrade process. The upgrade process reboots vShield Manager, so you might lose connectivity to the vShield Manager user interface. None of the other vShield components are rebooted. After the reboot, log back in to the vShield Manager. OPTIONAL: Login to Trend Micro Deep Security Manager and make sure it still can connect to vSM. ALWAYS take a snap of vShield Manager! vShield Manager upgrade from 5.0.x to 5.1.x is different as you need to upgrade its virtual hardware. See VMware KB 2044458 for detailed instructions. You must upgrade vShield App and vShield Endpoint on each host in your datacenter. Both can can be upgraded either through vSphere Client or vShield Manager interface. I personally prefer the later. Login vShield Manager, navigate to inventory panel, select View: > Hosts & Clusters. Under Datacenters / Your_Datacenter / Your_Cluster click the host on which you want to upgrade vShield App / vShield Endpoint. 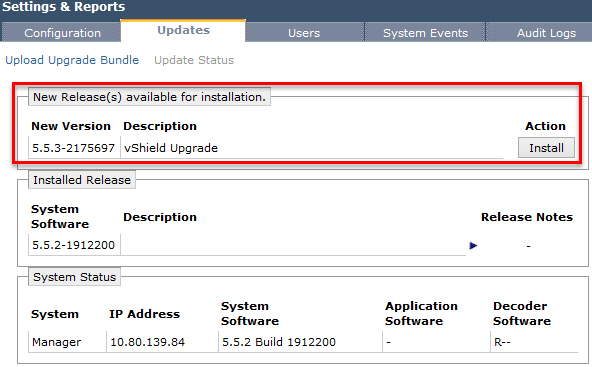 The Summary tab displays each vShield component that is installed on the selected host and the available upgrade version. Select Update next to vShield App or vShield Endpoint. Select the vShield App or vShield Endpoint checkbox. You can also select both and upgrade them in one go. Click Install. 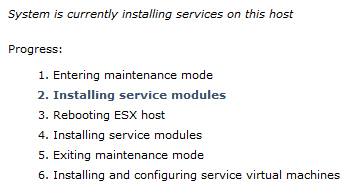 During vShield App upgrade, the ESXi host is placed into Maintenance Mode and rebooted. Ensure that virtual machines on the ESXi host are migrated (using DRS or vMotion), or that they are powered off to allow the host to be placed into Maintenance Mode. Log in to the vShield Manager, navigate to View: > Networks. Select the Datacenter, Network Vistualization, Edges. Select the vShield Edge. Notice the up arrow – Upgrade available. Click the Actions and select Upgrade. This is where it gets interesting! vShield Manager will NOT upgrade vShield Edge virtual appliance, instead it will deploy a new appliance, copy the config and then deleted the old appliance. super nice of you to provide straight talk procedure for the upgrade! found your post after failing to find simplicity in the 5.5.3 install and upgrade doc provided by VMware. Thank you for you feedback. Much appreciated.